Whether by land or by air, the G-SHOCK Mudmaster and Gravitymaster will get you there, every time. When an emergency call is broadcast over the police radio, units will respond by any means possible, often by patrol car and helicopter. No matter the method of transportation, officers will use any equipment that makes the job safer and more effective. 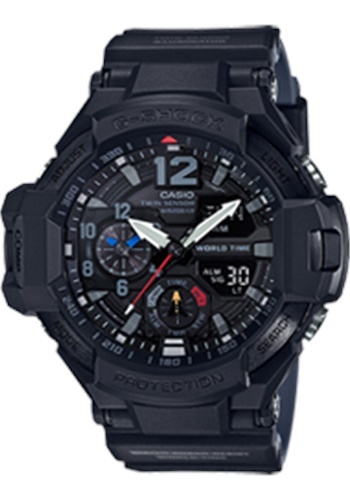 When it comes to the watch on their wrist, Casio offers the venerable G-SHOCK series for both the ground unit, with the Mudmaster, and the air unit, with the Gravitymaster. 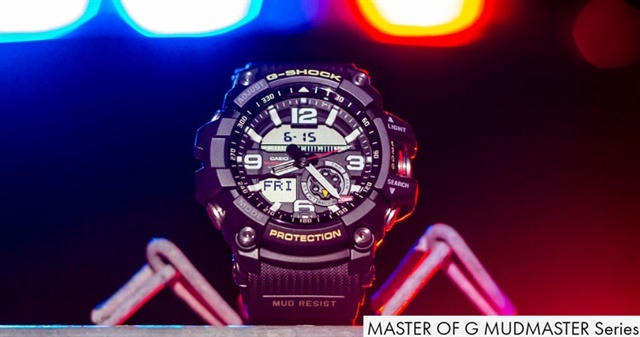 As the officers on the street drive to the call, they can rely on the G-SHOCK Mudmaster and its large numerals on the face to be easily visible with the Neo-brite Luminous hands. The selectable Auto LED Super Illuminator Backlight also initiates the LED lighting when the watch is angled towards your face, clearly showing the analog and digital time. Large, knurled side buttons allow for easy operation when cycling the through the various modes, including utilizing the Twin Sensor for ambient temperature or compass readings. An audible indicator upon the button presses can be muted for tactical response situations once arriving on the scene. From the air, the G-SHOCK Gravitymaster aides Tactical Flight Officers with its unique approach to the same call. With a need for darkness in the cockpit during nighttime patrol, the watch face illumination time can be adjusted to as short as 1.5 seconds, so as to not disturb the TFO’s night-vision. Quickly accessible stopwatch and timer modes are easily activated with the nicely sized side buttons, even while wearing Nomex flight gloves. As ground and air units converge on the call, both the Gravitymaster and Mudmaster have a dedicated side button for initiating the Compass mode, which comes in handy when the flight officer needs to direct a foot unit to a suspect with no visual reference points. If things get dirty during the situation, the ruggedness of the Mudmaster will protect it in just about any environment it’s exposed to. This same toughness keeps the Gravitymaster going in the often-tight confines of the aircraft cockpit. At the end of the shift, whether from street-level or hundreds of feet above, the G-SHOCK Mudmaster and Gravitymaster both provide the options and reliability that law enforcement looks for in a timepiece. G-SHOCK watches have been around for 35 years, having sold over 100 million units. Their popularity has remained strong with professions that need the proven strength and durability they offer. Few occupations require these attributes more than law enforcement. But even police work has its own, very unique specifications within various subsets. Once again, G-SHOCK has stepped up to the plate and hit a couple home runs. If any watch could be considered the “go-to” for law enforcement, this G-SHOCK may be it. A sturdy yet pliable textured nylon band with a double-clasp and close-set adjustments fits any wrist. The instantly recognizable case is defined by its thick, rubberized exterior with solid protrusions protecting the five side-mounted buttons. These buttons just might be the item that earns the G-SHOCK the title of Mudmaster. They use a cylinder guard structure, protected by gaskets on the shafts and cylinders to keep out dust, mud, and other contaminants. All this in addition to G-SHOCK’s shock and 200M water resistance for protection. Officers often can’t take their eyes off the task at hand, so the buttons each have a large, knurled surface for ease of locating and operating. Audible presses can be turned off if desired. This would mean nothing if there was no substance behind the look. That is clearly not the case with the Mudmaster. The watch face, although filled with information, is easy to read. From the oversized numerals at 12, 3, 6, and 9 o’clock to the two digital screens to the rotary mode indicator with its bright orange arrow. The minute and hour hands are coated with a Neo-brite Luminous surface and augmented by the LED backlight with selectable Auto Illuminator, which lights with the rotation of your wrist. The Mudmaster has two features that really set it apart from other brands. First, a digital compass. When selected with a dedicated side button, the user is presented with three methods of directional orientation. The top digital screen gives the magnetic direction in degrees, the lower left screen gives cardinal direction, and the second hand becomes a north indicator. The second key feature is the thermometer. Accessed by the button under the compass selector, the outside temperature is indicated on the top screen, user adjustable between Celsius or Fahrenheit. The Gravitymaster takes the best features of the Mudmaster, tweaks them a bit, then condenses it all into a slightly smaller package. The band has the same double-clasp and close-set adjustments but in this iteration the band is smooth. This style approach carries onto the case where the knurled buttons are replaced on the Gravitymaster with polished side selectors and less protruding protectors, beneficial when wearing flight gloves. These buttons may lack the gasket protection from mud and grime, but the watch maintains the shock and 200m water resistance. Key to the aviation target audience is the secondary clock face on the front for easy viewing of the 31 World Time zones. Also for the flight-minded, the Gravitymaster is equipped with the Twin Sensor for the thermometer and compass, the latter having bidirectional calibration, magnetic declination correction, and bearing memory. Additionally, this model adds a Hand Shift feature that moves the primary analog hands out of the way for viewing of the digital contents. All the other highlights from the Mudmaster are here on the Gravitymaster including a 2-year lifespan on the user replaceable battery with low battery indicator. Is this the watch for you? For law enforcement, whether on the ground or in the air, you’d be hard-pressed to find two more durable, feature-rich, dependable timepiece that looks good both on and off the job. 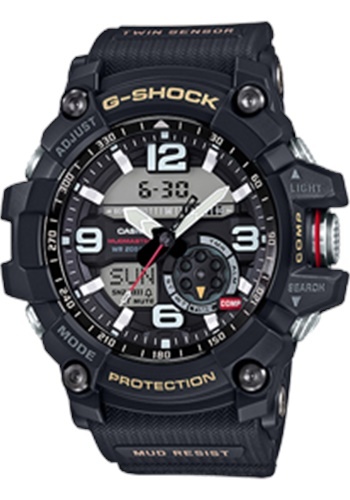 Casio G-SHOCK watches have proven themselves in the field for many years with a solid reputation as one of the toughest you can buy. 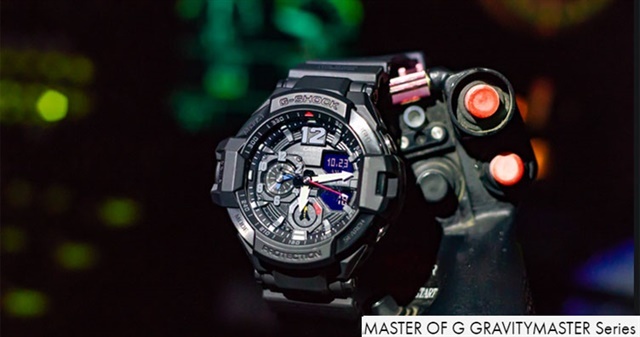 As the newest offerings in the G-SHOCK Master of G series, the Mudmaster GG1000-1A and Gravitymaster GA1100-1A1 look to carry that tradition forward. Available now at your favorite retailer.